PDF Slides of the Talk are available to download now!. Feel free to distribute to anyone you know that might be interested. We will soon put online the video of the talk, please check back later. Open source is an important software development methodology. It can also be an important part of business strategy. In this talk Ron Goldman, a Sun Microsystems researcher, will describe how open source works and discuss why a company might want to participate. He will touch on open source business models, building community, licensing, and common mistakes. Also covered is why open source is important to computer professionals, educators and regular people. 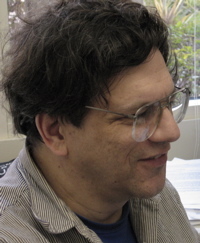 Ron Goldman is a researcher working at Sun Microsystems Laboratories on alternative software development methodologies and new software architectures. 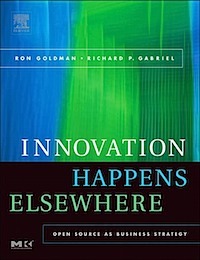 His OOPSLA 2006 paper "Conscientious Software" (co-authored with Richard P. Gabriel) explored ways to make software more robust—drawing on ideas from Biology and Complexity Science. Ron is currently a member of the Sun SPOT's project that is investigating the use of Java on small embedded, wireless devices. He was instrumental in defining the vision and details for the java.net website and helped start the Javapedia project. He has advised many Sun open source projects including OpenSolaris, NetBeans, OpenOffice, and Jini. He is the co-author of the book "Innovation Happens Elsewhere: Open Source as Business Strategy" published in April 2005 by Morgan Kaufmann. Prior to Sun, he developed a program to generate and manipulate visual representations of complex data for use by social scientists as part of a collaboration between NYNEX Science & Technology and the Institute for Research on Learning. He has a continuing interest in the design of programming languages and has developed various programming environments (IDEs). He has a PhD in computer science from Stanford University where he was a member of the robotics group.